We spoke with Kitakyushu City Mayor Kenji Kitahashi about the role the city played in the Meiji period industrial revolution in Japan, and the active efforts for international exchange to share its expertise on environmental efforts with other cities worldwide. -How has Kitakyushu City been publicizing itself overseas? In addition to Kitakyushu being geographically very close to the rest of Asia, the local government started efforts very early to share its expertise on overcoming industrial pollution with foreign cities.The foundation of our interaction with other Asian cities is the Kitakyushu International Techno-cooperative Association (KITA). I am certain that Kitakyushu can be a model for success in overcoming severe industrial pollution, which is of interest to other cities that want to improve their infrastructure in the face of issues with water and waste. So far, KITA has hosted 7,453 researchers from 150 countries, and both government and private specialists have gone overseas. 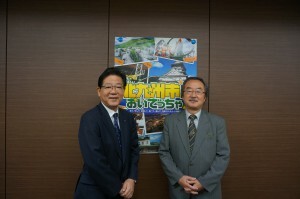 Being part of an Asian network with bonds based on the environment is a unique feature of Kitakyushu, and through this network efforts are being made to bring in visitors for a variety of purposes, such as tourism and MICE. -Tell us about Kitakyushu’s international cooperation through sharing its technology and experience in dealing with industrial pollution. There was an OECD conference in Milan six years ago discussing the themes of environmental problems and creation of a sustainable society. Thanks to a suggestion from the Japanese government, Kitakyushu City became the first Japanese municipality to act as a panelist at an OECD conference. In recent years citizens have become very concerned about health issues due to PM 2.5 from China, but relations between Japan and China are sensitive right now. However, we continued looking for a way to share Kitakyushu’s technology with China in order to help assuage citizens’ health concerns. As a result of a recent meeting between the Japanese and Chinese governments, a decision was made for Kitakyushu City to provide technological support to help with air pollution to the four cities of Shanghai, Tianjin, Wuhan and Tangshan. I hope to contribute to solutions for environmental issues that span national borders by making this project a success. -The Modern Industrial Heritage Sites in Kyushu and Yamaguchi were nominated for inclusion on the UNESCO World Heritage List next year. How is that progressing? We were informed of UNESCO adding the Kyushu and Yamaguchi industrial sites to the Tentative List around six years ago. Since then, we have been working together with the other local governments involved to be included on the World Heritage List, but there was one major obstacle, namely that the site in Yahata is still operating. The Agency for Cultural Affairs in Japan has very strict regulations for the preservation of cultural assets, and so the company was concerned about limitations being placed on their manufacturing. In response, we petitioned the national government to relax regulations and examine new methods for asset preservation that would also meet the needs of private companies. A new method for asset preservation was then approved by the Cabinet. This process led to the Japanese government nominating the modern industrial heritage sites as a candidate for the World Heritage List, and a decision will be made by UNESCO next year. Kitakyushu City would like to preserve these assets, as they are a local treasure. To that end we will strengthen our cooperation with the national government and other local governments involved and try our best to be included on the World Heritage List. -Tell us about the appeal of Kitakyushu and any plans for the future. Most people probably think of Kitakyushu as an industrial city, but it also has a lot of nature. It has a variety of delicacies like octopus from the Kanmon Straits and bamboo shoots from Ohma. The total fertility rate is also the highest of the designated cities, and due to the 24-hour pediatric care system we have established, Kitakyushu has ranked number one among designated cities for three years in a row according to a NPO survey ranking cities by ease of raising children. Above all, the warm character of its residents is the most appealing feature of Kitakyushu. When a marathon was held in February last year to celebrate Kitakyushu’s 50th anniversary, 4,700 volunteers gathered to help with the event, despite the cold. There were also around 280,000 spectators cheering from the sidelines, handing out water and even a variety of food. Everyone working together and getting excited about the same thing is part of the Kyushu character, and it is definitely present in Kitakyushu. A major goal for the future is for Kitakyushu to become a leader in exporting environmental technology to the world. I would also like to see a foundation for peace and prosperity similar to the EU made in Asia as well in the near future. The thing Asian cities want the most right now is lifestyle improvements through solutions to environmental issues. I will do my best to build trust and fulfill Kitakyushu’s role in contributing to solving issues, which I hope will create a new image for the city and new civic pride. Pictures provided by Kitakyushu City.